Seville (/səˈvɪl/; Spanish: Sevilla [seˈβiʎa], locally [seˈβi(ɟ)ʝa] ( listen)) is the capital and largest city of the autonomous community of Andalusia and the province of Seville, Spain. It is situated on the plain of the river Guadalquivir. The inhabitants of the city are known as sevillanos (feminine form: sevillanas) or hispalenses, after the Roman name of the city, Hispalis. 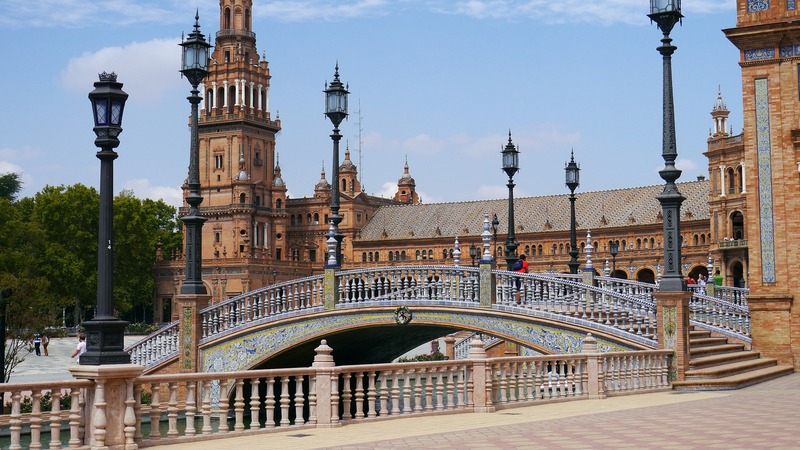 Seville has a municipal population of about 703,000 as of 2011, and a metropolitan population of about 1.5 million, making it the fourth-largest city in Spain and the 30th most populous municipality in the European Union. Its Old Town, with an area of 4 square kilometres (2 sq mi), contains three UNESCO World Heritage Sites: the Alcázar palace complex, the Cathedral and the General Archive of the Indies. The Seville harbour, located about 80 kilometres (50 miles) from the Atlantic Ocean, is the only river port in Spain. Seville is also the hottest major metropolitan area in the geographical Western Europe, with summer average high temperatures of above 35 °C (95 °F). Seville was founded as the Roman city of Hispalis. It later became known as Ishbiliya (Arabic: إشبيلية‎‎) after the Muslim conquest in 712. During the Muslim rule in Spain, Seville came under the jurisdiction of the Caliphate of Córdoba before becoming the independent Taifa of Seville; later it was ruled by the Muslim Almoravids and the Almohads until finally being incorporated into the Christian Kingdom of Castile under Ferdinand III in 1248. After the discovery of the Americas, Seville became one of the economic centres of the Spanish Empire as its port monopolised the trans-oceanic trade and the Casa de Contratación (House of Trade) wielded its power, opening a Golden Age of arts and literature. In 1519, Ferdinand Magellan departed from Seville for the first circumnavigation of the Earth. Coinciding with the Baroque period of European history, the 17th century in Seville represented the most brilliant flowering of the city’s culture; then began a gradual economic and demographic decline as silting in the Guadalquivir forced the trade monopoly to relocate to the nearby port of Cádiz. The 20th century in Seville saw the tribulations of the Spanish Civil War, decisive cultural milestones such as the Ibero-American Exposition of 1929 and Expo ’92, and the city’s election as the capital of the Autonomous Community of Andalusia.